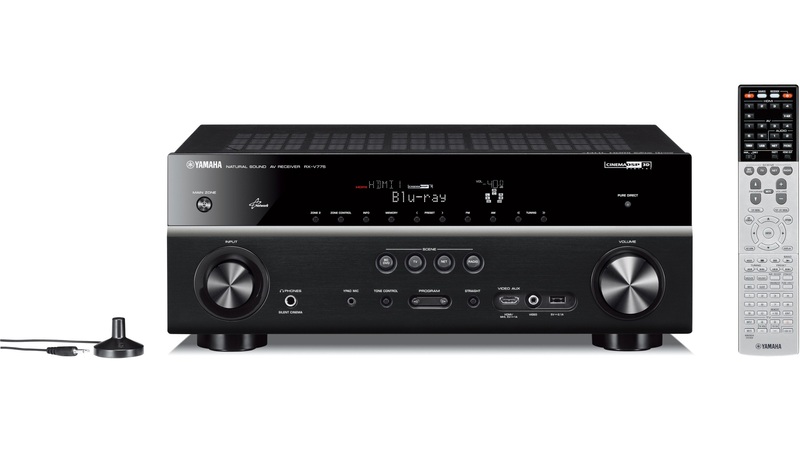 Yamaha RX-V775 is a 7 channel AV-Amplifier with up to 95 Watt for each channel. RX-V775 supports many audio formats. Below you find a list of the most important audio formats with a short description of each format. Dolby Digital is the most used audio format on DVD and is transfered to the amplifier through HDMI or optical/coaxial digital inputs. Dolby TrueHD is a High-Definition audio format developed for HD-formats like Blu-Ray and can only be transferred through HDMI to the amplifier. Dolby Pro Logic II is the audio system from Dolby that the amplifier will use for analog or two channels Digital sources like TV- broadcasts. Dolby Pro Logic IIx is a secondary audio format that makes it possible to transform 5-channel audio to 7-channel audio. This can be a useful feature since most Blu-Ray and DVD only have 5-channel sound. DTS HD Master Audio is a lossless HD audio formats from DTS. This format offers up to 7.1 channels and used on a variety of Blu-Ray films. DTS is an audio format that is used on a some DVD movies and offers up to 5 discrete channels + subwoofer. To achieve the best possible sound reproduction in a home theater setup RX-V775 is equipped with automatic room correction that adjusts a number of parameters based on measurements made using an included microphone. Noise level of each speaker automatically adjusted along with delay based on the placement of speakers. In addition adjusted frequency response of each speaker so that it fits the room and speaker. The specification for the equalizer for the main channels are 7 bånds (parametrisk), while it is 3 bånds (parametrisk) for the subwoofer channel. The room correction system that RX-V775 is equipped with is Multipoint YPOA-RSC (Yamaha Parametric Room Acoustic Optimizer- Reflected Sound Control) This system is Yamaha latest system and supports up to 8 measuring points, which should ensure good home theater experience is most types of home theaters. To get the best possible bass reproduction in your home theater setup RX-V775 has individual bass handling of the different channels. That means you can set different value for lowpass filter for each speaker group. The low pass filter can be set to a wide range of frequencies. The available frequencies are 40, 60, 80, 90, 100, 110, 120, 160, 200Hz. RX-V775 is equipped with something that Yamaha calls for Silent Cinema. This processing customizes the audio for headphones. This allows you to experience a certain surround effect using headphones. 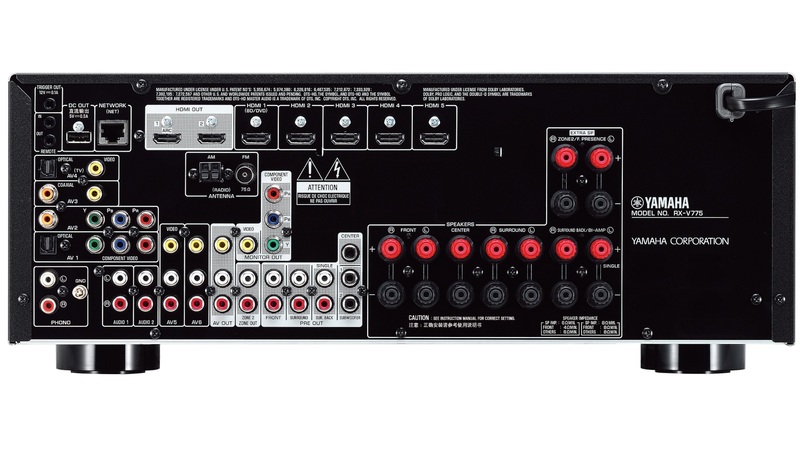 If you have analog sources that must be connected to a TV or projector through the amplifier, the amplifier has video conversion from composite, s-video and component digital HDMI signal. This ensures that it is only necessary with a HDMI cable to the projector / TV.The Video signal can be upscaled to HD format so that it fits with the TV / projectors resolution if you want to make this transformation in amplifier instead of TV / Projector. 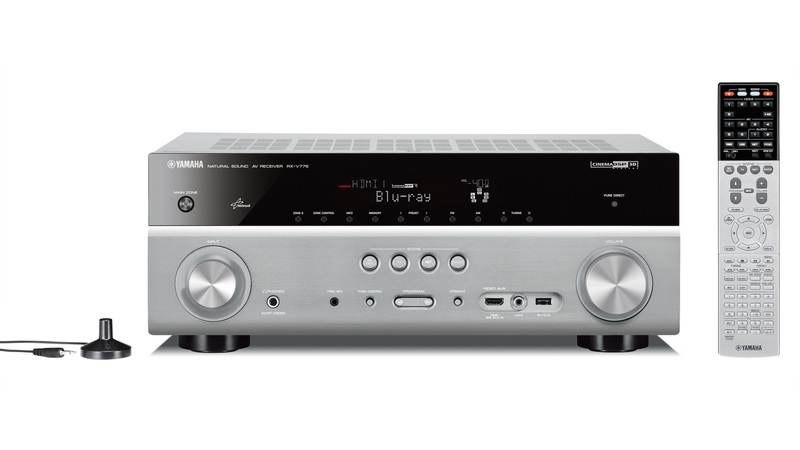 The amplifier can upscale to 720p, 1080i and 1080p signal. RX-V775 is equipped with a wide range of connection option for video sources. It has 5 HDMI, 2 component and 4 composite inputs.It also has 4 RCA inputs for analog audio connection and 2 optical digital inputs and 2 coaxial digital inputs. The amplifier is equipped with 2 HDMI- 1 component, and 1 composite monitor outputs.The amplifier supports HDMI Arc (Audio Return Channel), which means it can receive audio from a TV from the same cable that transmits image from amplifier to TV. This keeps you from having a seperate digital cable or RCA cable from the TV to the amplifier. Requires that the TV supports HDMI Arc. 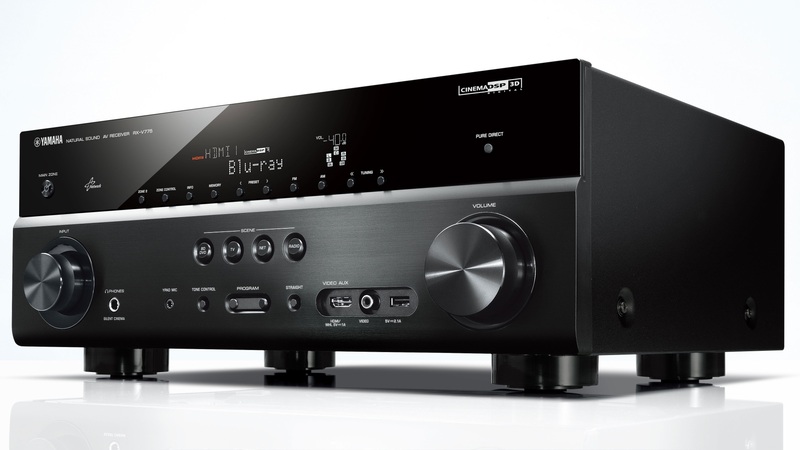 The amplifier is equipped with 7.2 RCA preout output that allows you to connect to power amplifiers and active subwoofer. Like many other amps RX-V775 have embedded multimedia functionality that reduces the need for PC and other computer components in your setup.Playback of audio files is possible from the network or from USB. To see details of the audio formats that are supported see technical specifications. RX-V775 is DLNA certified so you are assured that it is compatible with other DLNA equipment. It is DLNA certified for audio playback over network. To connect to the network is the amplifier equipped with a standard network connector. The AirPlay feature gives you the ability to play music wirelessly from your PC or MAC with iTunes, wireless playback from your iPhone, iPad or iPod either from local music collection or online services like Spotify. RX-V775 allows for playback in multiple rooms, with different sources for each room. For stereo playback the amplifier is rated to provide 2 x 95 Watt with measuring method RMS, 20-20.000Hz, 8 ohm, 0.09% THD and for multi channel up to 7 x 95 Watt by measuring method RMS, 20-20.000Hz, 8 ohm, 0.09% THD.In setups where there is no need for the integrated power amplifier for the surround back channels can these power amplifiers in RX-V775 be configured so that the front speakers are bi-Ampet with two amplifiers for each front speaker (separate amplifier for bass and treble / midrange). With audio processing for 7 channels and power amplifiers for 7 channels this amplifier has the following possible speaker configurations. It supports 5.1 speaker config that gives possibility for front, center and surround speakers in addition to a subwoofer. If you only want a 5.1 setup this amplifier has the possibility to biamp the front channels so you can use 4 channels for the two front speakers. This can give a better audio experience. It supports 7.1 speaker configuration that gives opportuinity for front, center, surround and rear surround in addition to a subwoofer. For a more detailed explanation of the possible speaker configurations you should read speaker configuration section of our home theater amplifier guide. The remote is programmable and teachable. This means that you can enter codes for other components you own or you can use other remotes to train the remote supplied. It is developed own applications to control RX-V775 from IPhone, IPad and Android. This allows you to control the amplifier without using the supplied remote control. Applications can be loaded from the App Store or Android Market. RX-V775 is in sale and the lowest price that is observed is kr 8,999,-. Use the links to price engines on the right side to find the cheapest stores. Are you something about home theater amplifiers may want to ask questions about it in our forum for home theater amplifiers. Here you will find many experienced users.